With the cutting of the ribbon, the Evergreen Extension opened on December 2, 2016! Whew! Has it been a year already? It sure has. The Evergreen Extension opened to the public at 12 p.m. on December 2, 2016 for revenue service. With that, the SkyTrain became one of the longest, automated driverless rapid transit systems in the world! TransLink on the Move: Evergreen means Go! Last week marked the start of our TransLink on the Move series where we’re breaking down some of the highlights of our 2016 Annual Report. This week, we’re featuring the long awaited Evergreen Extension! The opening of the Evergreen Extension was a milestone event for TransLink and for Metro Vancouver. 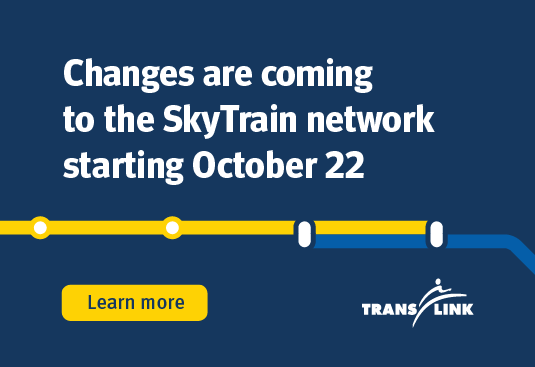 This significant expansion of our integrated transit network brings us to 79 km of SkyTrain meaning that TransLink now operates the world’s longest fully-automated rapid transit system! 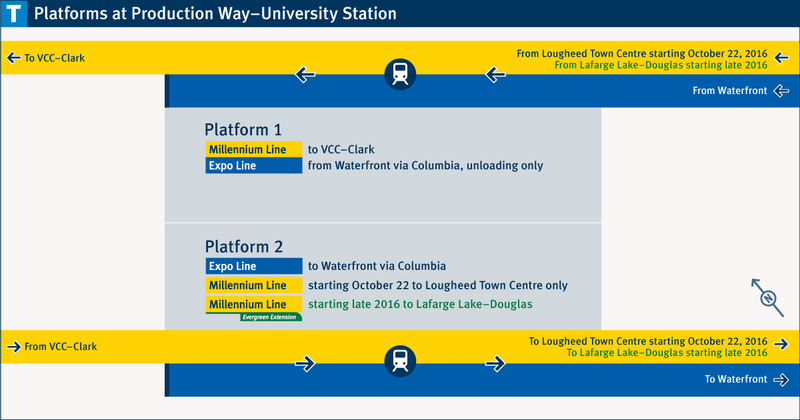 Included in the Evergreen Extension is a two-kilometre Tunnel (the longest in the SkyTrain network) connecting Coquitlam to Port Moody, a new SkyTrain operating pattern and six new stations connecting riders to more destinations in our region. Lincoln Station #bluehour #evergreenline #mytranslink #coquitlam #skytrain #transportation #nikonphotography #grantmatticephoto ? 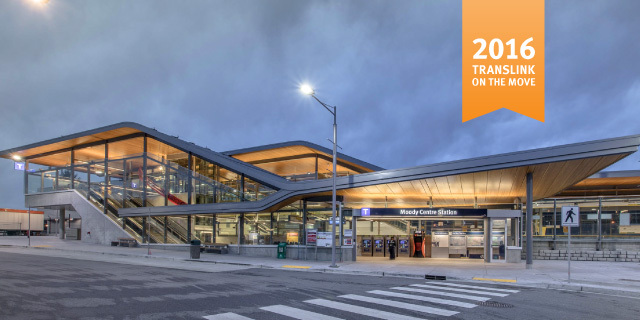 The Evergreen Extension boasts beautiful new open concept stations with plenty of glass allowing for natural light, picturesque views and beautiful public art. If you haven’t yet had a chance to check out the new stations, have a look at some of the shots captured by transit enthusiast Ivan Chan. Or better yet, become your very own #EvergreenExplorer by checking out some of the great java stops along the new route. Want to know more about highlights to the transit system in 2016? Stay tuned to the blog for a new feature every week! To find out more, including a construction schedule for the next twelve months, check out the full news release, the Province’s Evergreen Line site or TransLink’s Evergreen Line page. There’s also a photo gallery from the announcement on Facebook! Funding for the project is a partnership between the Government of Canada, the government of British Columbia and TransLink. TransLink will be responsible for operation and asset management of the Evergreen extension when it opens. It’s been a long time coming. 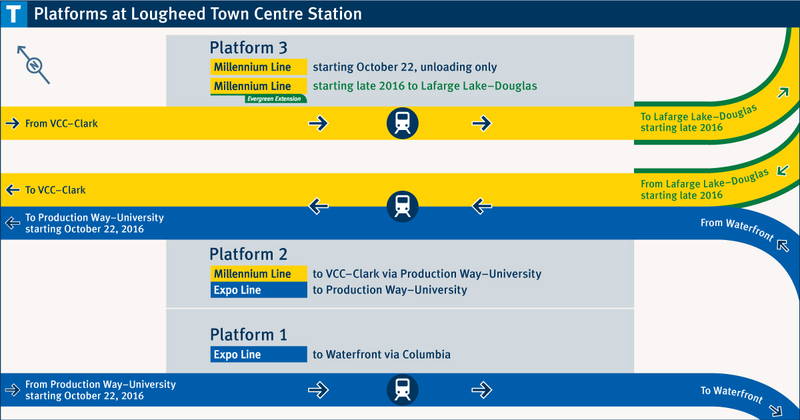 If you didn’t take in the local news yesterday, there was an announcement by three levels of government regarding the Evergreen Line. B.C. Minister of Transportation and Infrastructure Blair Lekstrom, the Honourable James Moore, Minister of Canadian Heritage and Official Languages and Senior Minister Responsible for British Columbia, Richard Walton, mayor of North Vancouver and chair of the Mayors’ Council on Regional Transportation, and Honourable Denis Lebel, Minister of Transport, Infrastructure and Communities were all on hand to announce that Pedre Contractors Ltd. will be installing new underground power lines in Port Moody and Coquitlam and Hans Demolition and Excavating will be removing two buildings in Coquitlam and one in Burnaby to make way for the new line. Here’s the link to the official press release. 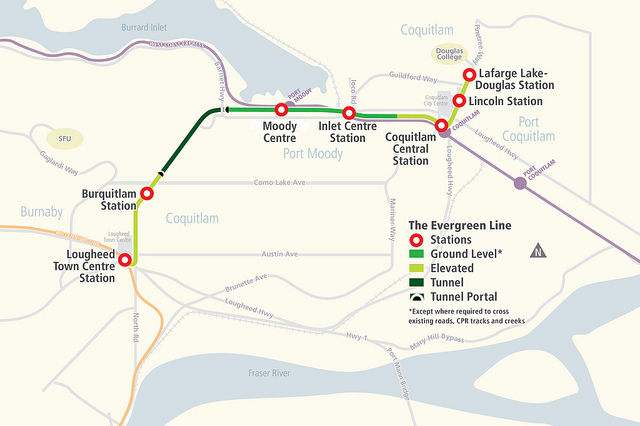 Linking to the Millennium Line, the Evergreen Line will connect Coquitlam to Vancouver via Port Moody and Burnaby. It’s scheduled to be completed in 2016. There’s a lot of work to be done in five years, so expect more announcements in the not too distant future!